We launched Quick Access in Docs earlier this year to help users spend less time searching for the right documents and more time crafting ideas. 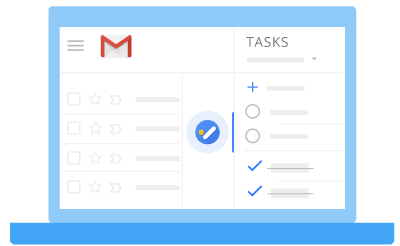 We’re now making this feature available to all G Suite users. Previously it was only available on a subset of G Suite editions. Quick Access uses artificial intelligence to suggest relevant files in the right hand “Explore” panel of Docs based on your Google Drive activity and information in your document. You can use this to add related resources to a document you’re working on, discover additional content that’s relevant to projects, and more. See our Help Center to find out how to use Explore in Google Docs. We’re making the search in Google Docs’ “Explore” panel easier by adding natural language Processing. This means you can search in a more natural and intuitive way. Just describe what you’re looking for, and Docs will find it for you. So you can search for things like “show me slides shared with me last week” or “show me documents I created this month” and Docs will find the best results. This is similar to the natural language processing used in other Google products and will show you relevant files and information from your Google Drive, including Docs, Sheets, and Slides files. See our Help Center to find out how to search from inside a document in Google Docs. 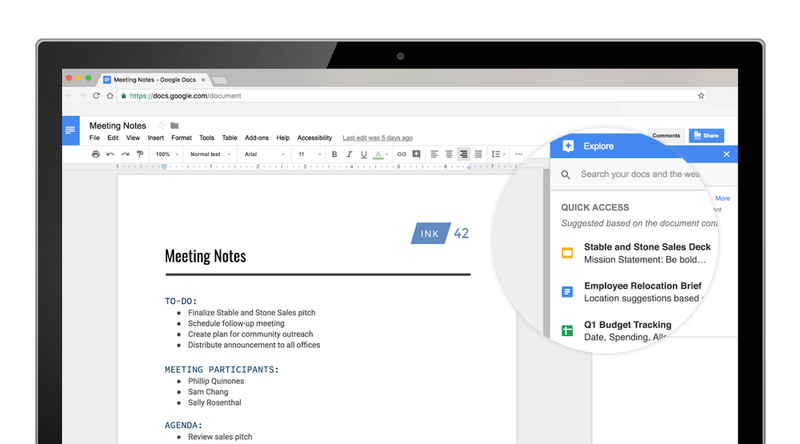 We’re making the Quick Access feature in Google Docs available to more G Suite users and are adding natural language search when you’re looking for documents. We hope these launches mean you spend less time searching for documents and more time working on them. G Suite for Education customers who have already purchased Jamboards will qualify for the one-time management and support fee program. While all devices come with a free one-year warranty, our partner BenQ is offering an optional three-year warranty at a discounted rate. See here for details. To purchase a Jamboard at this newly discounted price, email jamboard-sales@google.com or contact your reseller. For more information on these new prices, please reference this guide. Jamboard is designed to make learning a more interactive and engaging experience through real-time, peer-to-peer collaboration. With its online platform for shared problem solving and ideation, Jamboard has been bringing collaboration to new heights in the classroom. To help make this technology more accessible to educational institutions, we’re offering a new, discounted price for Jamboard, specifically for G Suite for Education domains.
. We hope that these two reports will help you better understand the historic and current availability of products for your users. To view the report, Open the Admin console > Reports > G Suite Apps Monthly Uptime. 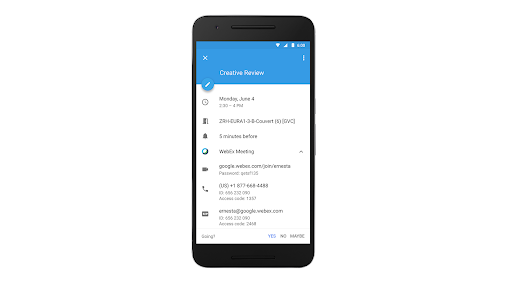 Use our Help Center to learn more about the G Suite Apps Monthly Uptime report and its data. We’re introducing a new report in the Admin console that shows the worldwide availability for G Suite services in previous months. This report, called the “G Suite Apps Monthly Uptime” report, adds to the information on G Suite’s current status and future availability in the G Suite apps status dashboard. We hope that these two reports will help you better understand the historic and current availability of products for your users. 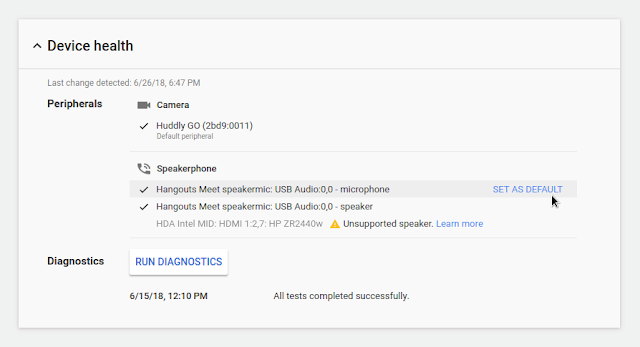 , the Hangouts Meet device will automatically reset back to the recommended configuration for microphone, speaker and camera between uses. If you’re using other peripherals or custom configurations, an alternative default configuration can also be configured in the Admin console. To do this, open the Admin console, navigate to Device management > Google Meeting room hardware, and then find the specific unit whose default peripheral you’d like to change. Click on that unit, open the device health section, and click the desired device. 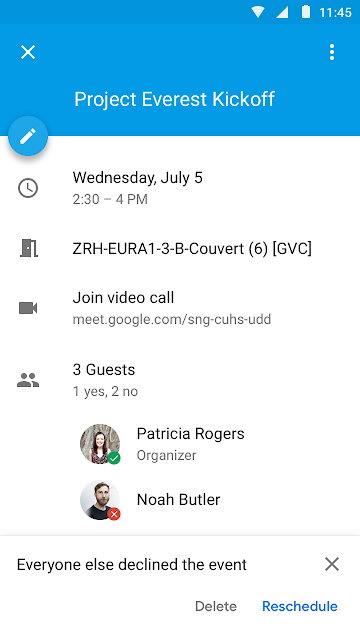 We’ve enabled new features in Hangouts Meet to ensure your users always find their meeting rooms configured correctly and ready for their upcoming meetings. As an admin, you can now set a preferred mic, speaker and camera to use for all meeting rooms. Going forward, if you’re using only qualified peripherals, the Hangouts Meet device will automatically reset back to the recommended configuration for microphone, speaker and camera between uses. If you’re using other peripherals or custom configurations, an alternative default configuration can also be configured in the Admin console. When creating an event on the web, simply select the “Out of office” Calendar entry type. The Out of office object will have a different look on the Calendar grid, signalling to others that you’re unavailable. Google Calendar will automatically decline meetings that occur during this time period. You can customize both the decline message as well as the visibility of the title of your out of office object. Going forward, Google Calendar will try to intelligently detect, based on the title entered, when you’re creating an out of office object and change the type automatically. You can always manually change this if you’d like to opt for a different entry type. By setting your working hours, you protect your personal time from your work time. People who will try to schedule meetings with you outside of these hours will be informed that you are not available at that time. You can already set your working hours to one interval for all days of the week. With this launch, you can now customize your work hours for each day separately. 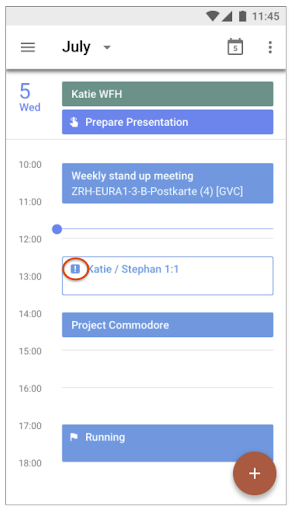 Based on your timezone and past scheduling patterns, Google Calendar can now infer your working hours. You may see a prompt asking you to set them, and you can further customize them as needed. For more information on these and other settings in Google Calendar, check out the Help Center. Whether you’re on vacation or just offline at the end of your workday, Google Calendar can help protect your time out of the office. We’re introducing a new out of office option and customizable working hours to further improve your digital well-being. With this launch, we’re making the process of searching your entire domain and large OUs easier and more transparent. If a data type supports domain-wide search, you can now select “All Accounts” to search the entire domain. 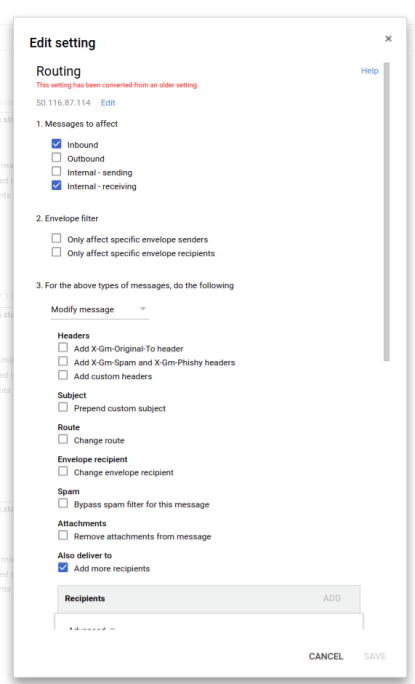 As Vault processes your large search request, you’ll see an activity indicator and the amount of time that has elapsed. You’ll also have the option to cancel your search or run another search in a new tab. When your search is complete, in addition to your results, you’ll now see the total time taken for the search. For a Gmail search, you’ll also see the total number of accounts searched and the number of accounts searched per second. This will give you an idea of Vault's performance during the large search. We’re also making it easier for organizations to export large amounts of Hangouts Chat data. Going forward, export data from Hangouts Chat will be condensed into a small number of files. Previously, you’d see one conversation per file; now you’ll see multiple conversations included in the same file, until the file size limit is reached. For example, in the past, 100 conversations would be exported as 100 MBOX or PST files. With this launch, those same 100 conversations will be exported as just one or two MBOX or PST files, making it simpler to process the results. In addition, each Chat conversation will continue to have metadata associated with it, but with two new fields: (1) type of conversation (direct message or room), and (2) conversation ownership (either the room name or a comma-separated list of accounts that participated in a direct message). 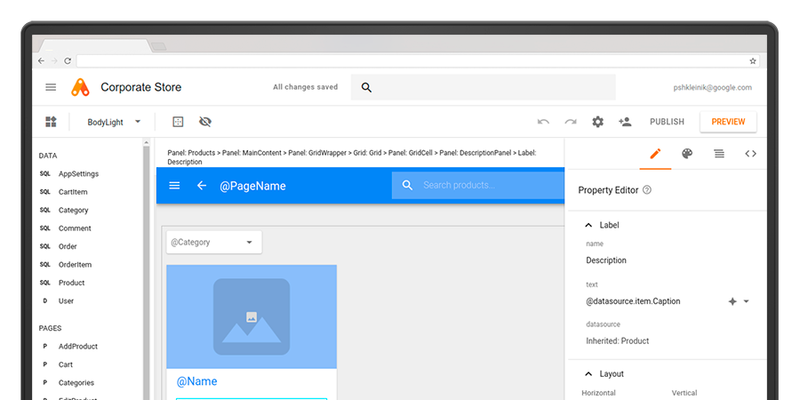 We're introducing new features in Google Vault that allow for more granular retention and provide a more transparent search experience. These features can help you retain exactly the data you need and thereby reduce your liability risk, as well as improve your eDiscovery process with better search and export capabilities. 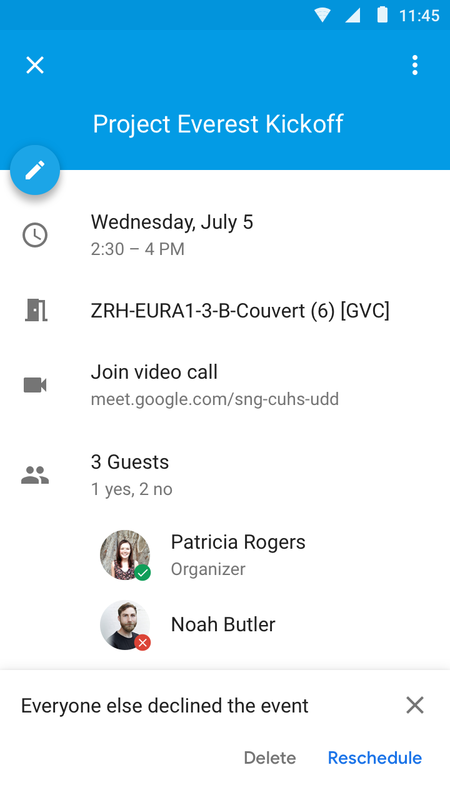 Previously, Hangouts Meet recordings were subject to applicable Drive retention rules. 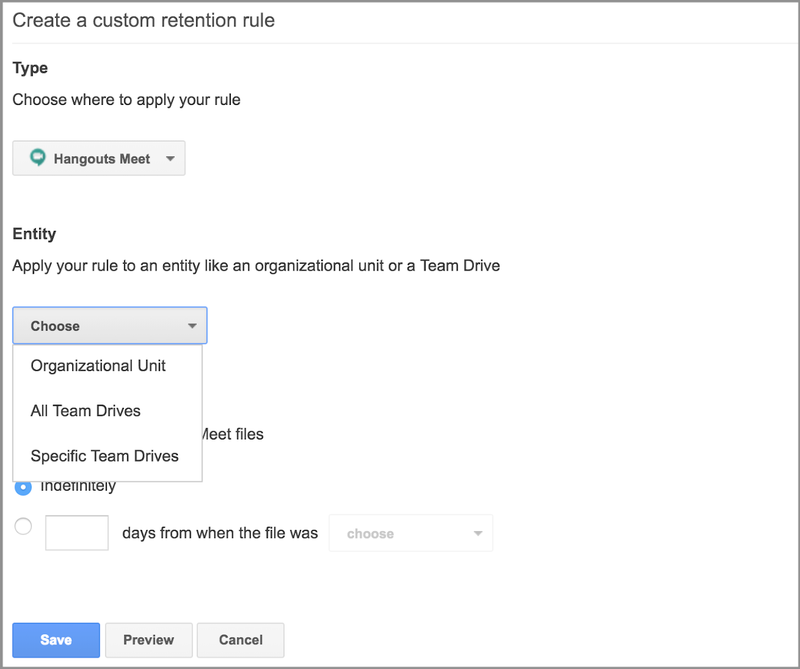 With this launch, you can set default and custom retention rules specifically for Hangouts Meet. This will allow you to set shorter retention periods for Meet recordings if, for example, they happen to contain more sensitive content. As a G Suite admin, you can now also set custom retention rules specifically for Drive files that have been moved to a user’s trash. 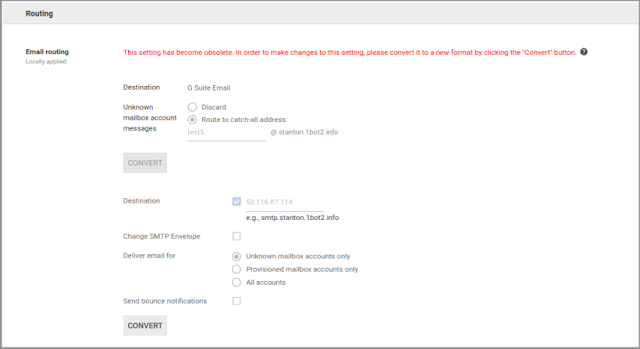 This option provides more flexibility for organizations who wish to control the lifecycle of files deleted by users separately from those files still active in their users' My Drive and Team Drives. 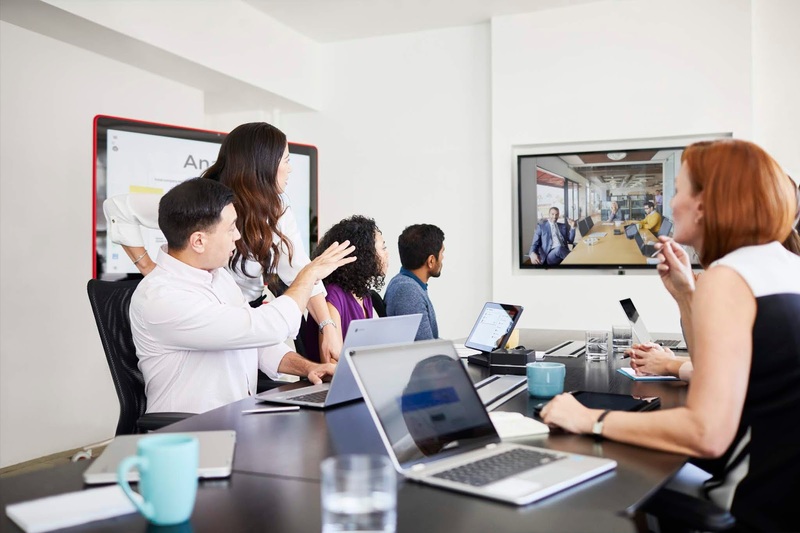 interoperability with SIP/H.323 standards based video conferencing systems and Skype for Business in Hangouts Meet through the Pexip Infinity Platform. 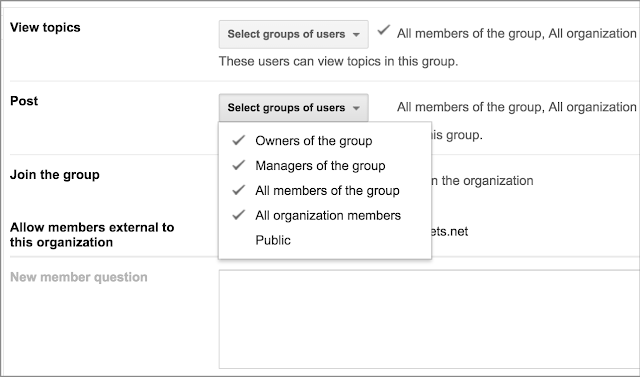 You can now enable this feature in the Admin console at Apps > G Suite > Google Hangouts and checking the box for “Turn on interoperability with other systems" under “Meet Settings.” After the feature is enabled and a token is generated, you will need a license from Pexip for the solution to work. For complete instructions on enabling third-party interoperability and more information, visit the Help Center. Earlier this month, we announced interoperability with SIP/H.323 standards based video conferencing systems and Skype for Business in Hangouts Meet through the Pexip Infinity Platform.
. You can also use our Help Center to find out more about how to convert a classic Site to a new Site and what to expect when you convert a site. As a reminder, the automatic migration tool to transfer Google Sites from classic Sites to new Sites will start rolling out to end users on June 19. The tool makes it quicker and easier to move sites created in classic Sites to new Sites. The tool automatically creates a draft of a classic site in new Sites. This new draft site will have the updated look and feel of new Sites, and contain the content from the classic site. When the new site is ready to go live, it can either be published to the URL of the classic site (to replace the original site and automatically redirect viewers), or published to a new URL. For full details on the tool and how it works, see our announcement for the admin preview of the tool. You can also use our Help Center to find out more about how to convert a classic Site to a new Site and what to expect when you convert a site. You can choose a color for your theme. When you choose a theme color, it will apply to your header background, titles, action buttons, and more. You can pick a predefined color, or a custom one. After you pick a theme color, you can select a complementary color for the background. 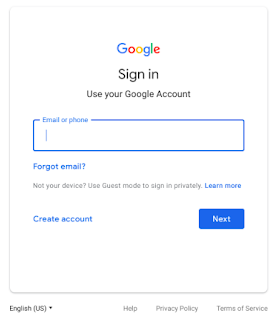 See our Help Center for more details on how to change the theme of your Google Form. To help Google Forms users create more personalized surveys, feedback forms, quizzes, and more, we’re introducing new theme customization options. Specifically, you can now choose colors and fonts to theme your form. This has been a top feature request from our users, who have asked for more options to create forms that match their organization or team branding. We hope these options help you build forms that look and feel just right. , our cloud-based, collaborative whiteboard, is available for purchase in an ever-growing list of countries such as the United States, Canada, the UK, and select parts of Europe. We’re now expanding that list further, bringing Jamboard to Australia and New Zealand. G Suite customers in Australia and New Zealand can now purchase Jamboard for $7,999 (AUD), which includes two styluses, an eraser, and a wall mount. See the table below for pricing. G Suite customers based in Australia and New Zealand can contact their Google Cloud sales rep, our distributor, BenQ, or visit our website to learn more about how to start jamming with colleagues today. Over the past year, we’ve announced that Jamboard, our cloud-based, collaborative whiteboard, is available for purchase in an ever-growing list of countries such as the United States, Canada, the UK, and select parts of Europe. We’re now expanding that list further, bringing Jamboard to Australia and New Zealand. 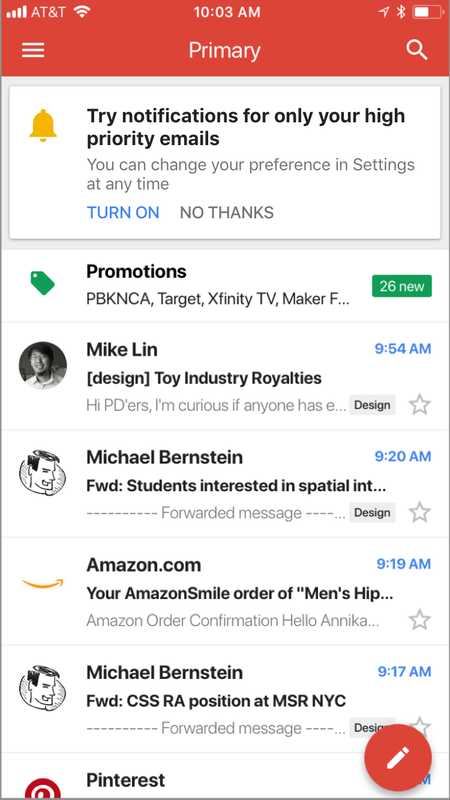 emails land in your Gmail inbox, so you know when your attention is really required. An inventory of desktop and laptop devices within the enterprise that access corporate data. Device information including screen lock, disk encryption, and OS version. To see the report, open the Admin console and visit Device management > Endpoint Verification. Endpoint Verification is available for ChromeOS, macOS, and Windows devices. It requires a Chrome extension to be installed. On Windows and MacOS devices, it also needs a native app which works with the extension. Extensions and apps can be installed by users individually or deployed centrally. See our Help Center article for admins to see details on how to deploy Endpoint Verification. 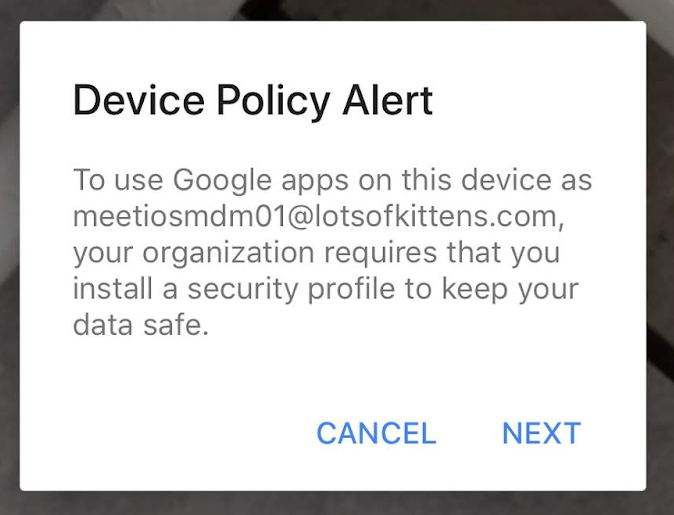 When the Endpoint Verification extension is installed on a user’s device, there will be a notification shown to users (see image below). 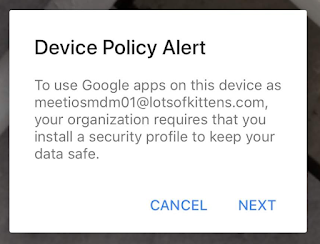 The user will have to click “Agree” before data from their device is shown in the admin’s Endpoint Verification report. If the user does not click “Agree,” information about that device will not be shown. The user Help Center has information about Endpoint Verification and user devices. 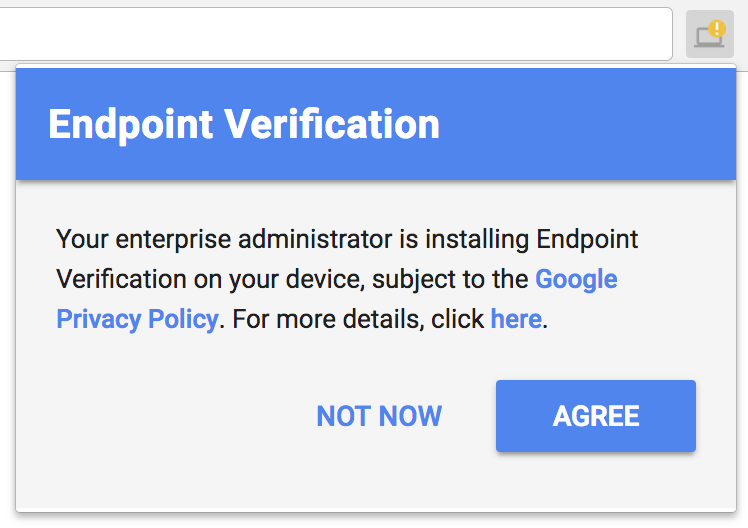 Endpoint Verification collects information via Chrome extensions and native apps on users’ devices, and displays that information to admins in a new report in the Admin console. It’s a lightweight and easy solution for desktop and laptop device reporting, and we hope this visibility empowers admins to maintain a strong security posture for their organization. It’s easy to get used to doing things a certain way. This can be a good thing if you're prepping for the World Cup, where process, repetition and routine can make you a champion. But if you're like the rest of us who rely on certain workflows to get things done at work—like budgeting or filing expenses—“trusting the process” doesn’t always feel rewarding. App Maker was created to enable your line-of-business teams to build apps for the jobs these bigger apps don't tackle. With App Maker, you can shape company processes like requesting purchase orders, or you can speed up business workflows like filing and resolving help desk tickets, as if you designed and built the processes yourself. Since launching App Maker in our Early Adopter Program, we've made changes and added new features to make it even better for our customers. 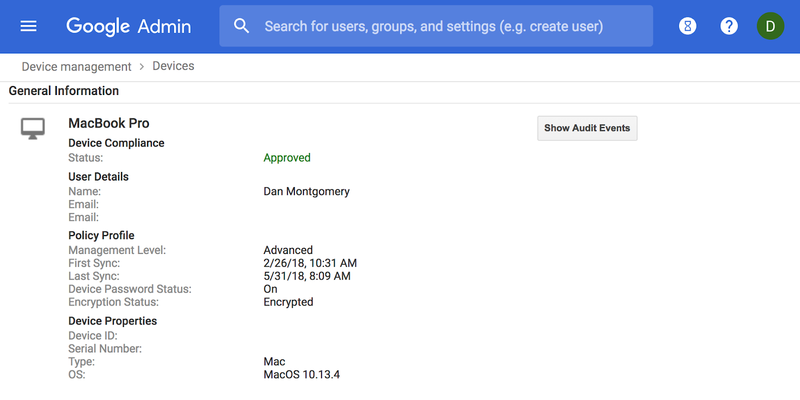 Managed: In the coming weeks, G Suite administrators will have visibility over the apps running in their organization including owners, usage metrics and OAuth permissions. Expanded OAuth Whitelisting controls mean administrators will also be able to prevent apps from running without their approval. Learn more. App Maker is now turned on for your G Suite Business, Enterprise, Education, or Enterprise for Education domain, unless you’re a K–12 G Suite for Education customer or you’ve chosen to manually opt in to new services. If App Maker isn’t yet enabled for your eligible domain, you can turn it on in the Apps > Additional Google services section of the Admin console. 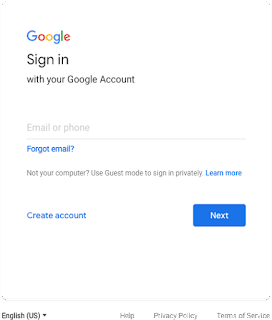 App Maker comes with built-in support for Google Cloud SQL, which requires a Google Cloud Platform account. To set up Cloud SQL for your domain, follow the steps outlined in this Help Center article. You can also connect App Maker to your own database using JDBC or a REST API. As a G Suite admin, you can manage the use of App Maker in your domain. For example, you can view the activity of users creating App Maker apps using the Drive audit logs, or view the activity of end users of App Maker apps in the OAuth Token audit logs. For more information on the management capabilities available to G Suite admins, visit the Help Center. App Maker is now an additional Google service, but it offers 24x7 technical support and service-level commitments. It is also compliant with ISO 27001 and SOC (1, 2, 3) and offers accessibility features to help meet the needs of your users. At launch, however, App Maker is not ISO 27017 and 27018 compliant. Please note that this corrects our previous communication. For more information on App Maker, check out the Help Center.